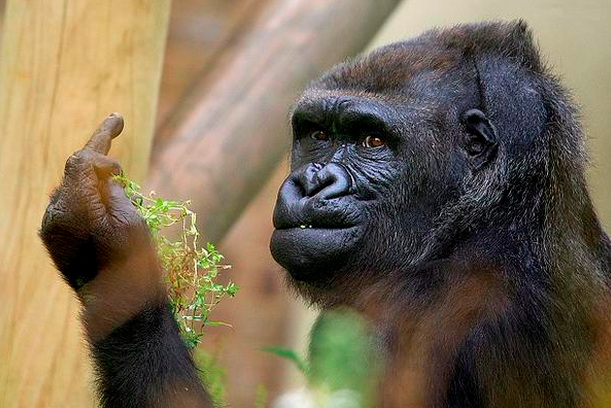 Gorilla appears to flip off photographer at Bristol Zoo -- you have to see the pic! Is this King Kong's relative? Just when we thought we'd seen the greatest gorilla on the Internet, there's one in the U.K.'s Bristol Zoo with some serious attitude. The Bristol Post reports that photographer Bob Pitchford was simply trying to catch a snap of the gorilla chewing on some grass, but instead, he got the bird! PHOTOS: Is This the Most Handsome Gorilla? While this photo may have just been very well-timed and nothing more, it's hard to deny, as Bob told the paper, that the animal is a "bit cheesed off." "When I saw the pictures, I just thought 'you little devil'," Bob said. And while it's too early to say, this gorilla certainly has what it takes to become one of the most popular images involving this rude gesture. You know, just like this kid! As a professional photographer of animals, Bob admitted, "I've never seen anything like this." Us too, Bob! Talk about one angry primate! Gorillas can be sweet too, though. Watch the video below to see how Koko the gorilla mourned her friend, Robin Williams.